-4.5 cups berries; large ones like strawberries roughly cut (this pie uses whole blueberries plus cut strawberries and cut cherries. I often also use whole raspberries, blackberries and mulberries.) You can also use other fruits (or a mix thereof) like apples, pears, cranberries, peaches. Depending on the fruit, pecans or walnuts make a great addition. 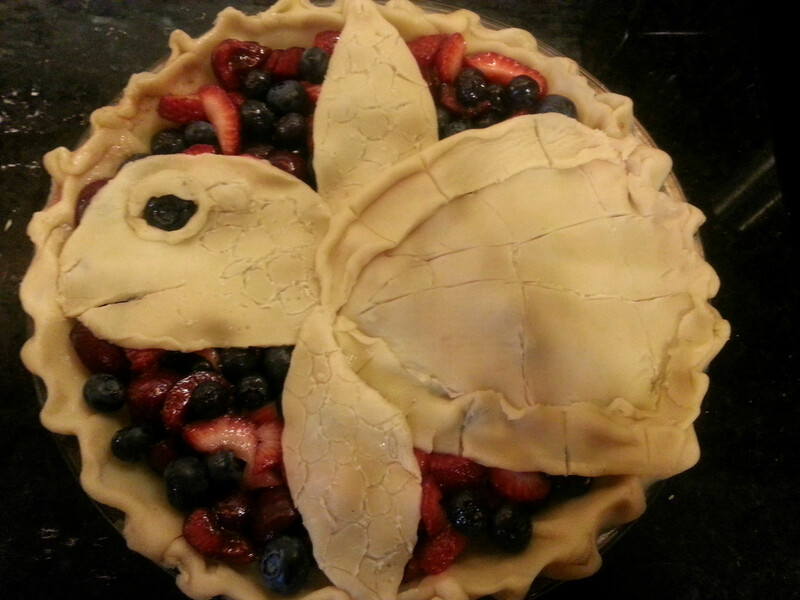 Method: Folks, this pie is ridiculously easy. First, chop the fruit and put it into a bowl. Heat your oven to 425 degrees. 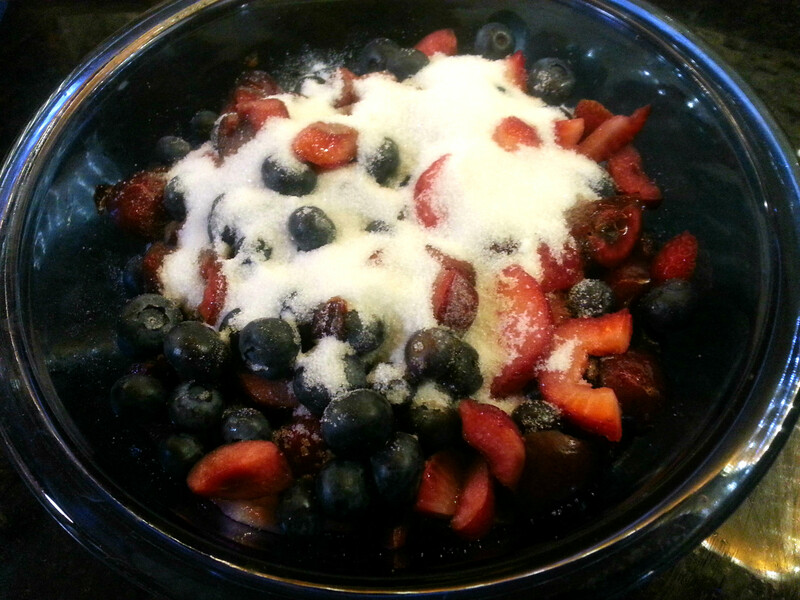 Pour the sugar onto the berries and mix well. Let sit 10-15 minutes. 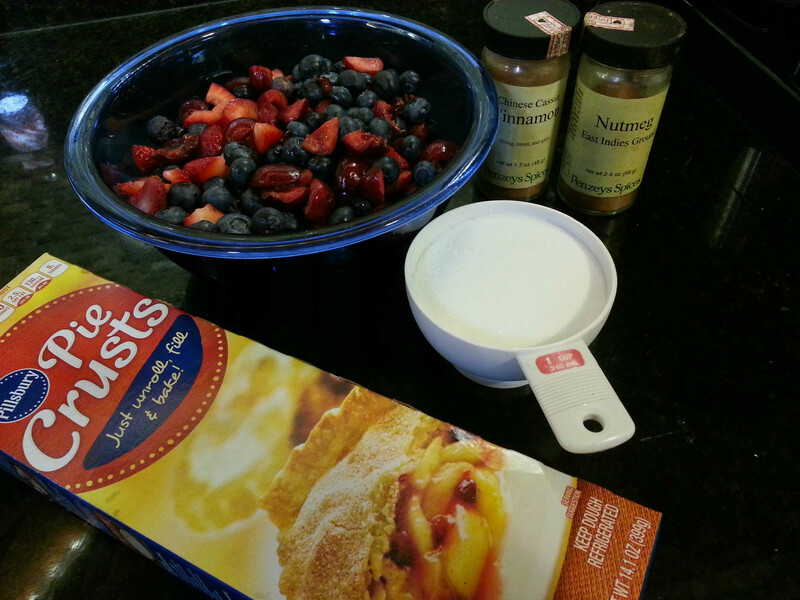 While the berries macerate, it’s time for pie crusts. I know, I know, I like to make just about everything from scratch. But sometimes I’m in a time crunch, plus I find the pre-made crusts work better if I’m doing a fancy top crust that needs to hold together. You’ll see momentarily. 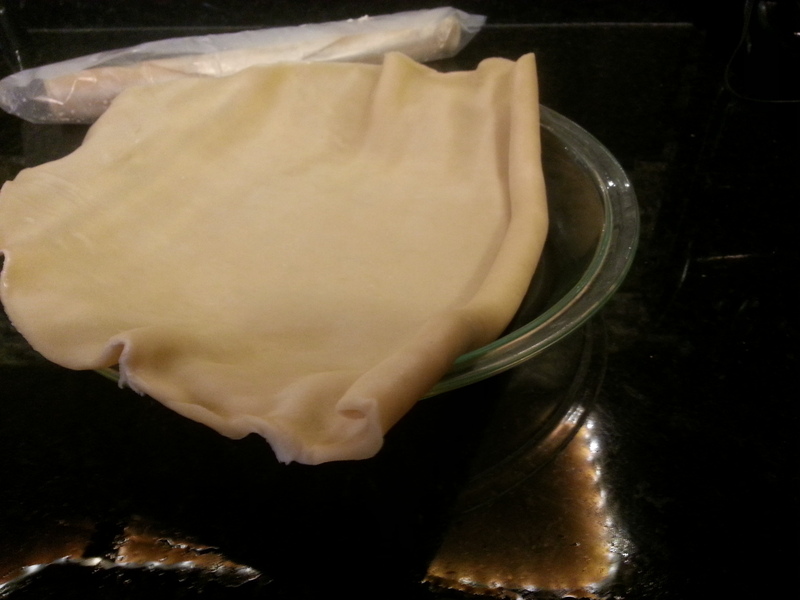 For now, press one crust into the bottom of a pie dish, preferably deep dish, and preferably glass. 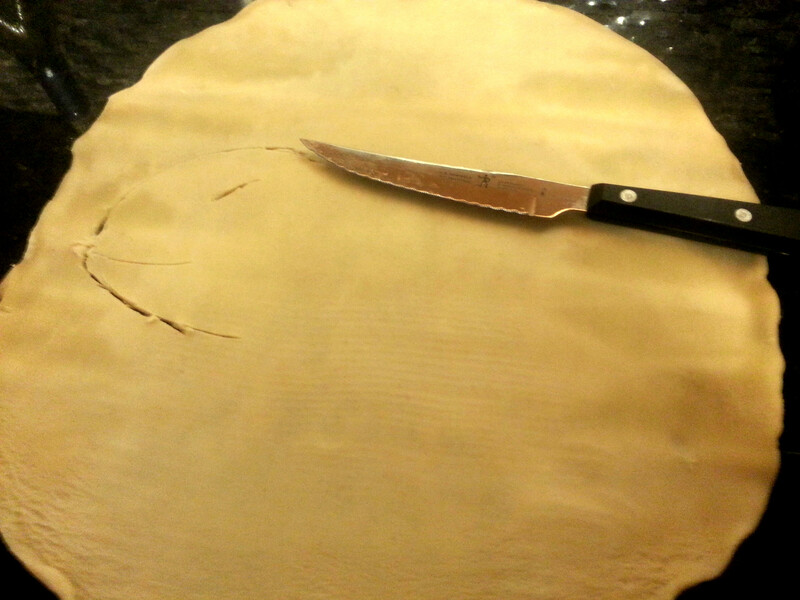 Now, cut your second crust into the desired shape. Sure, you could stick with the typical lattice, or in the fall you could make cute leaf shapes. But why not get more creative? Like, really creative. I like the pre-made dough because it’s pliable instead of crumbly and allows me to play with it a little if necessary. 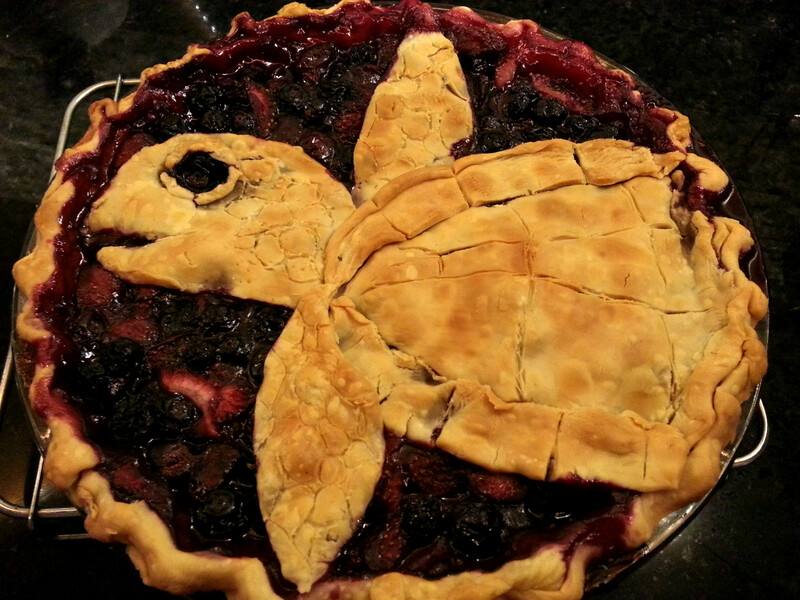 I’ve decided to make a sea turtle top crust. Your crust typically will not expand like a sugar cookie, but rather may shrink slightly, so take that into consideration with your design. For example, I’m just making a slit for the mouth instead of cutting out a huge chunk… watch how it turns out. Next, sprinkle the cinnamon, nutmeg, optional lemon zest and cornstarch or flour onto your berries and mix well. 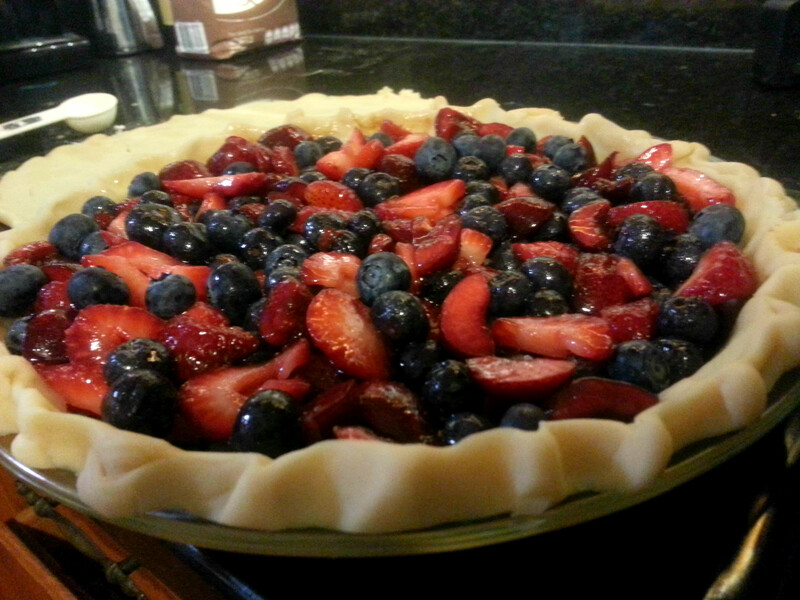 Berries (and fruits like peaches) tend to be juicy and your pie will turn out very runny if you skip the cornstarch. Still tasty, but you’ll need a spoon instead of a fork. Now pour the mixture into the bottom crust. Make the berries about even with the top of the crust, do NOT heap them. Again, berries are VERY JUICY and they bubble up during baking. If you heap them, you’re going to have berry jam lava oozing all over the bottom of your oven. Trust me, it happens to me nearly every time. Now is the fun time where you put on your top crust and tweak it as you see fit. Put foil around the crust edges to prevent burning and remove it for the final 20 minutes of baking. Then, put the whole thing into the oven! I’m using a toaster oven and it works smashingly. 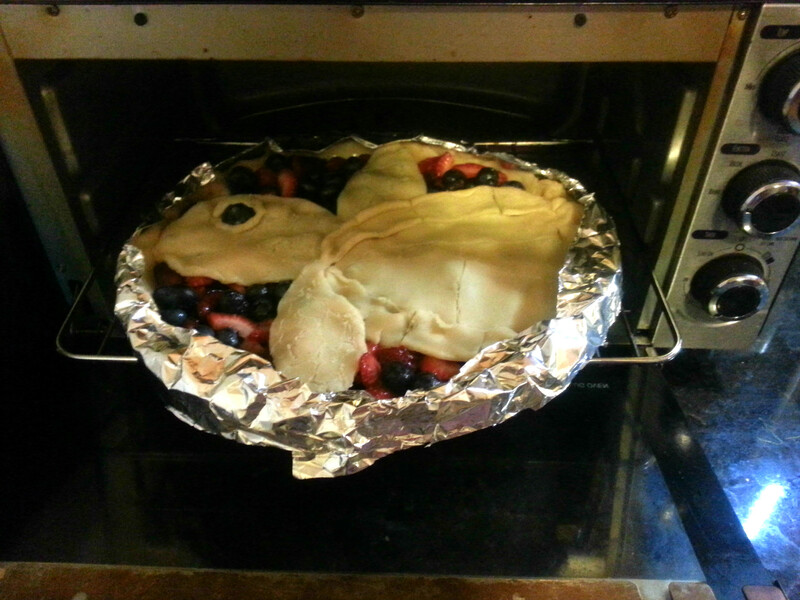 Bake for 40-45 minutes or until the berries are bubbly and the crust is golden. REMINDER: berries will ooze in your oven. Put a baking sheet or foil below your pie pan to catch the jammy drippings. After waiting for it to cool (if you tear into the pie too soon it’s very runny and take-the-skin-off-the-roof-of-your-mouth-hot), you have a beautiful, fun pie that is impossible to resist. Enjoy!